Hon. William “Bill” Kephart is District Court Judge for the Eighth Judicial District Court, Department XIX. He is a proud native of Clark County, Nevada and graduated from Basic High School. During high school, he earned the prestige rank of Eagle Scout and remains a lifetime member of the Boy Scouts of America. He later earned his Bachelor of Arts in Criminal Justice from the University of Nevada, Las Vegas, and his Juris Doctorate from the Marshall College of Law in Cleveland. Judge Kephart previously served as both a Deputy City Attorney for the City of Las Vegas and a Deputy District Attorney in Clark County. His assignments included Chief Deputy Attorney in the Special Victims Litigation Unit and the Habitual Offender Unit. Judge Kephart was not only instrumental in the establishment of the office’s first DUI specialized team; he also obtained the necessary funding to battle internet crimes against children. 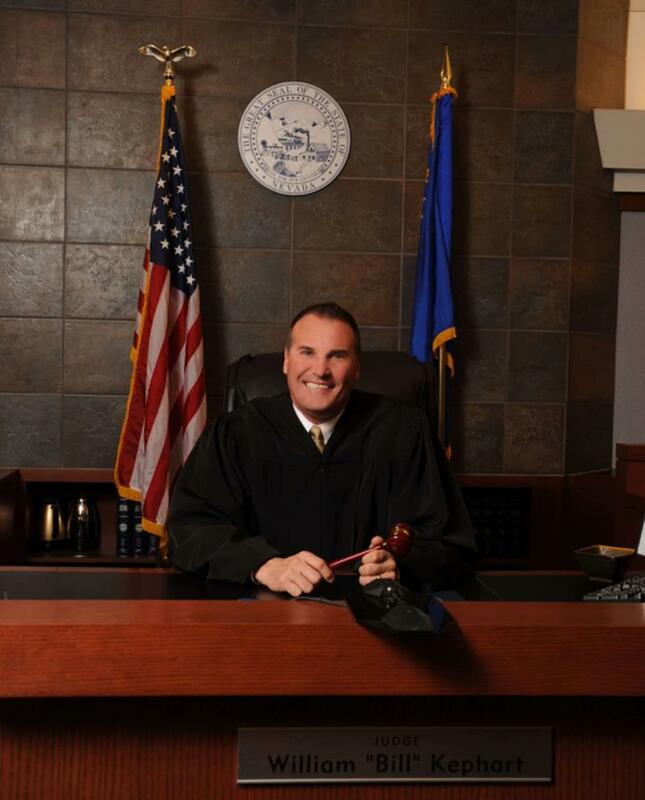 The voters of Clark County elected Judge Kephart to the Las Vegas Justice Court in 2010. While in Justice Court, he presided over arraignments, preliminary hearings, DUI Court and Veterans Court. He was subsequently elected to his current position in 2015. Since 2010, Judge Kephart has presided over 175 trials. Judge Kephart continues to reside in Clark County with his wife of 28 years. Together they raised two children and now enjoy their three grandchildren. Department 19 is currently assigned Civil, Construction and Criminal dockets. Department 19 hears Criminal matters on Mondays and Wednesday at 8:30 a.m.
and Civil matters on Tuesday and Thursdays at 9:00 a.m.
Department 19 does have a chambers calendar. Matters regularly placed on chambers calendar include: Motions to Withdraw; Motions to Associate Counsel; Motions for Leave; Motions to Serve via Publication; Motions to Lift Stay; Motions for Enlargement of Time for Service; Motions to Substitute; Motions to Amend; Motions for Rule 54(b) Certification and Status Checks on Blocked Accounts. Department 19 uses a Court Recorder. Department 19 considers telephonic appearance requests on a case by case basis. Department 19 does NOT utilize Court Call. Counsel must arrange telephonic appearance the Department's Law Clerk, prior to their scheduled appearance. Department 19 will grant unopposed motions in advance of the hearing date. Unopposed matters will be placed on the Department's chambers calendar prior to the scheduled hearing. Counsel directed to fax a file-stamped copy of notice of new-opposition to Department 19's Chambers and then contact the Law Clerk. All Default Judgments for a total award of less than $100,000 may be submitted to chambers. All Default Judgments for a total award of $100,000 or more must be set on the Department´s regular motion calendar. Live testimony is required at the prove-up hearing. Any lawsuits dealing with real property also require live testimony. Department 19 requires proposed orders to be submitted to chambers within ten (10) days of notification of the ruling, pursuant to EDCR 7.21. Counsel designated to prepare the order is required to provide a draft to opposing counsel(s), allowing for a reasonable opportunity for review and comment. Non-drafting counsel is required to sign the order prior to submission. Disputes may be resolved by scheduling a conference call with the Court or submission of competing orders for the Court's review. Counsel directed to submit courtesy copies of all motions that counsel would like the Court to hear within 48 hours of receiving a file-stamper copy from Wiznet. All courtesy copies should be hand delivered to Department 19's chambers single sided, 3 hole punched and all exhibits tabbed. Courtesy copies provided by email to Department 19 ARE NOT sufficient. Failure to provide the Court with courtesy copies may result in your motion being continued to a later date to allow counsel to provide a courtesy copy to the Court.